4.4 out of 5 based on 12 bloggers and 1 commenters. 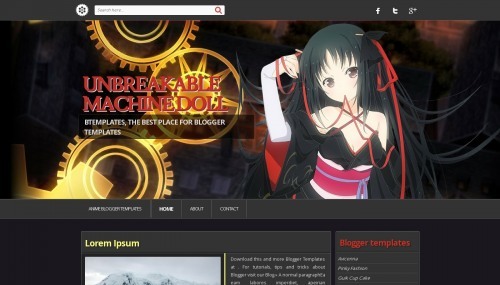 Unbreakable Machine Doll is a free blogger template with 2 columns, magazine-styled, right sidebar, gallery-styled, an exclusive design for Blogger, footer columns, social bookmarking icons, posts thumbnails, related posts support, well designed threaded comments and geometric motifs. Excellent template for blogs about anime or movies.